If you like the taste of freshly baked pastries with a delectably sweet apple filling... you're on the wrong page. You won't find it here. Eggo Bake Shop Apple Twists are more than a little bit lame. The bread-aspect of this product feels light and fluffy as you take your first taste, but after a millisecond in your mouth the texture becomes gooey, mushy, sticky and weird. The apple filling isn't like the apple pie sort of filling you might expect. It comes across as more of an apple paste. 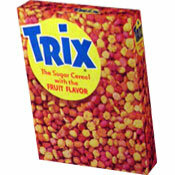 The flavor leans more toward the acidic aspect of an apple rather than toward the sweet. For a much, much better product from the Eggo Bakery Shop collection, try Eggo BakeShop Swirlz. Dietary considerations:: Each 1 pastry serving has 190 calories, 7 grams of total fat, 3.5 grams of saturated fat, 15 mg cholesterol, 29 grams of total carbs, less than 1 gram dietary fiber and 3 grams protein. 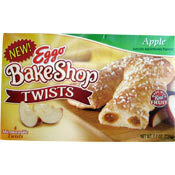 What do you think of Eggo Bake Shop Twists - Apple? Eggo Bake Shop Twists - I can not find them in any of the food stores in my area of Carlisle PA 17013. HELP - klquinn1959@yahoo.com - If anyone knows where I can purchase them. THANKS.